The first opera of the Fringe this year. 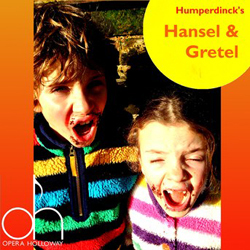 This production was a new translation of Humperdink’s German opera Hansel und Gretel. I always prefer to see operas in their original language as productions as translations never quite sound as good when sung, and in the age of supertitles, there’s really no need to sing in English. However, Hansel und Gretel is normally performed in English, and this translation (by the director Christopher Moon-Little) is certainly up-to-the-minute in its cultural references. The staging too has been directed in a very contemporary way. For this reason, the show is likely to be very accessible to older children, teens and other opera novices. The music for this show is excellent, and I enjoyed a number of the arias. Humperdink’s pacing has the most common opera problem (one that many films face too) – strange pacing. The introductory scene is very long, although there is a wide variety of music, and singers that lifts it. However, the climax is very Witch heavy and has little musical interest and variety or drama to sustain what is a very long section. This, as in many other operas, is made all the longer by the well-paced action throughout the middle section of the work. I enjoyed this opera, and it is a great “starter” opera – rather like a sweet Rosé is often the introduction to the rich and varied world of wine. There is plenty to inspire the audience, and this creative new staging and translation. I’d have rather heard it in German, but then I’m a geek! There is much to admire in this cast – full of strong voices. The leads playing Hansel (Katie Coventry) and Gretel (Jenny Stafford) created a wonderfully believable sibling relationship switching between love and hate. I also really enjoyed the characterisation employed by Fiona Hymns as the Dew Fairy and Krystal MacMillan as the Sandman. Although her vocal performance was excellent, I think there were some weaknesses in Sarah Denbee’s acting performance as the Witch. Unlike the other characters, I was concious of the fact she was acting – her performance lacked a depth of conviction which left her character a little shallow and fake. The musicians were also excellent and deserve recognition for their flawless performance. Despite my dislike of operas in translation, I couldn’t help but enjoy the light-heartedness of this version of Hansel and Gretel. Any weaknesses in performances by the cast were not sufficient to distract from the overall quality of the music, acting and singing. I imagine families will really enjoy this production, as will both opera lovers and opera virgins. If you’ve not been to see an opera before, I can’t recommend many better places to start than this production. This entry was posted in Opera, Reviews and tagged 5 stars, fringe 2013, opera, reviews on 15th August 2013 by .